Mathimurugan M. of Arucottuthurai village is looking for a job abroad. Born in a fisherman’s family, the 34-year-old does not want to venture into the sea, even as he waits for an opening. He does not want to continue the family’s traditional occupation. Mathimurugan is not alone. Many young men from traditional fishing communities prefer working abroad as manual labourers to fishing. Arucottuthurai, a coastal village, is part of Vedaranyam municipality in Nagapattinam district, Tamil Nadu. According to municipality officials, the population of the fishing village was 2,592 as of 2017. About 300 young men of Arucottuthurai are believed to be working abroad. Though fishermen from neighbouring coastal villages such as Vizhundhamavadi and Vellapallam also take up jobs overseas, Arucottuthurai, near Kodiakkarai or Point Calimere, has more of its young fishermen abroad. Fishermen quitting their occupation and going abroad is not new, according to the villagers. “My grandfather went abroad but my father stuck to fishing,” said 24-year-old Manikandan S. It became a trend among the youth of the fishing community about 15 years ago. Karpagam Udayasuriyan (50) is candid that her son Prabhu does not know fishing and that she forced him to go abroad. “I didn’t want my children’s families to experience poverty like I did,” she said. Widowed when her son and daughter were toddlers, she survived by doing whatever labour work she could find in and around her village. Mathimurugan, who lost his father at sea during a fishing trip, had decided that he would not take up the traditional livelihood, but would work abroad. With three younger sisters to care for, he felt that fishing was a highly risky occupation. Accidents happened earlier as well, but not so frequently. Most often the fishermen managed to come ashore in their wooden catamarans. Over the years, the fishermen started observing a change in wind patterns and ocean currents, making it difficult to navigate their way and reach the shore safely. Manickam V. (75) said that they knew wind direction and ocean current over the seasons earlier, but not now. Traditional knowledge learnt during fishing trips while accompanying older family members helped them judge the waters and decide whether to venture into the sea or not and where they would net a good catch. The older fisherfolk are not able to judge the sea’s characteristics now. Vivekanandan. V, secretary of Fisheries Management Resource Centre (FishMarc), an organisation promoting sustainable resource management, attributes the unpredictable nature of the sea to climate change. According to the fishermen, the changes became more obvious after the 2004 tsunami. “The sea has become more choppy and rough in recent years,” said Rajendran V., who has been fishing for more than 25 years. Though the fisherfolk are not able to attribute the shift to changing climate, they are able to perceive the changes. While Manickam kept repeating that the tip had disappeared, Rajendran explained that from their village they could see the Kodiakkarai beach projecting into the sea, which they usually referred to as the tip. Kodiakkarai is the last point in the Coromandel Coast, before the coast changes direction into the Palk Bay area, the two having distinct and different ecosystems. “The land must have disappeared about 20 years ago,” said Rajendran. A closer look at the satellite maps reveals a shift in a small stretch of the coast between 1984 and July 2018, the furthest and latest period for which images are available. Rajendran finds waves higher now and increasing suddenly at times. “Also the sea has moved in and so the distance between the village and sea is less now,” said Manickam. The sand dunes, the thorny plants on the dunes and the casuarina trees that acted as natural barriers also disappeared during the tsunami. “While the fishermen face risk at sea because of changing weather patterns, the families at the coast are vulnerable because of loss of barriers,” said Mathimurugan. The changing climate has not only made fishing more risky, but has resulted in reduced fish diversity and dwindling fish resources. “Fish such as kooral, kathalai and poovaali are not at all seen these days or we catch them in extremely small numbers,” said Rajendran. “The first two are big croakers of Scianidae family and they are definitely scarce,” said Kizhakudan. Nowadays the fishermen do not find uluvai and naangal also – larger and shorter sharks. As per CMFRI’s marine fish landings of 2013 and 2017 pertaining to Tamil Nadu, while catch of oil-sardines, croakers and black pomfrets has decreased, that of ribbon fish, snappers and skates has increased. Vivekanandan attributes increased landings to fishermen increasing their fishing area and the use of ring seines. According to Kizhakudan, the coast known for large predatory fishes several decades ago, is giving way to small pelagic fish, caught in large quantities. Arucottuthurai fishermen claim that no one in their village uses prohibited ring seines and pair trawlers, but other people using these means has led to over-exploitation and depletion of resources. Unlike the handful from the older generation that went abroad after a few years of fishing, the present generation is as good as non-fishers in their knowledge of fishing. “Among the working population, 20-25% work abroad,” said Manimohan R. of FishMarc, who did a recent study about migration of fishermen in Cuddalore. The construction industry attracts the most number of unskilled and semi-skilled migrants from Tamil Nadu, 11.4% of the total, according to the Tamil Nadu Migration Survey – 2015, carried out by the Centre for Development Studies, Trivandrum. Those who go abroad – even those who have undergraduate degrees and technical diplomas – work as labourers in the construction, oil and shipping industries, referred to as general workers. Mathimurugan joined as a general worker and managed to become a driver after seven years. The young men’s earnings are almost comparable to what the fishermen earn. While Manikandan’s father earns a minimum of Rs 12,000 as a helper in a boat, he earns Rs 20,000 abroad and sends home Rs 14,000. Yet, citing uncertainties of earning and inherent risks in fishing, besides social conditions, the young prefer to work abroad. At the destination, fishing does not figure in the occupation of migrants. Naturally, those who fished earlier lose their traditional skills. This is obvious in the occupation of returned migrants. About 2.4% of the migrants work in the fisheries sector on return. However, according to Manimohan some fishermen going to Gulf countries work in fishing vessels and resume fishing on return after a few years. Kizhakudan tries to get the youth from fishing communities interested in related vocations such as sea cage farming, aqua sports, marine life education and the like, to enable them to be financially independent, but it is a difficult pitch. Manikandan and Mathimurugan are trying again to go abroad, despite having lost money to fraudulent agents and despite tough working conditions. 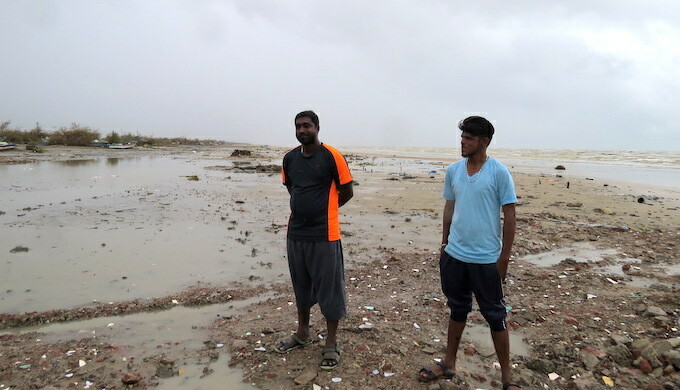 Destruction caused by weather events such as the recent Cyclone Gaja helps them justify their decision. Given the many uncertainties involved in fishing, to the young men from fishing communities, the call of the foreign land is stronger than the call of the seas. This story is being published as part of GIZ-CMS Media Fellowship.